Oh God the Asos Ice Cream backpack! With spring coming back I’m getting all over cute patterns and colourful stuff!! Now I want it haha! It is a cute backpack perfection indeed! And Ice cream seems to be a very fashionable thing at the moment – Mulberry have gourgeous tops with Ice cream prints and LV campaign posters this season are more like an ice cream ad. Now you’re making me think about it… today they re-opened Pull&Bear in Oxford Street in London, and they were giving away free…. ice-cream! Ice cream is the new big thing in fashion hahhaha! the asos one is sooo cute! and of course i’m totally digging the DVF one. DVF one is just so summery! Brightens my mood every time I look at it! Plus hello pastel trend! I will definitely be bringing my vintage Coach black leather backpack (very similar to The Row beauty above) out of storage this spring/summer. Sounds like a keeper! Tweet me a picture (@fashionwishlist) when you do, I am still deciding which one to go for! I really like the Paul Smith one actually. And the first one is pretty as well. 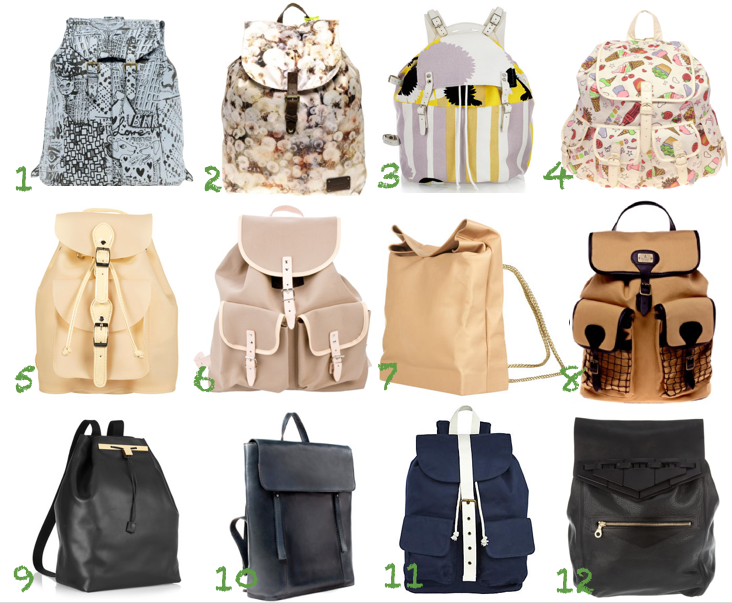 You are currently reading Believe It Or Not: Trendy Backpacks at MY FASHION WISH LIST.